Echeveria secunda grows well in full sun to dense shade near the coast and does best with some mid-day protection for inland gardens. Echeveria secunda is not particular about soil type but will not do well in a moist garden. Echeveria secunda is native to Mexico. The rosettes get to 6" or so across and then Echeveria secunda starts producing pups along the lower parts of the stem. Echeveria secunda blooms during the Summer months. The Hens and Chicks grows to a foot tall and forms a spreading clump that expands a few inches in each direction a year. Echeveria secunda is Winter hardy into the mid teens. 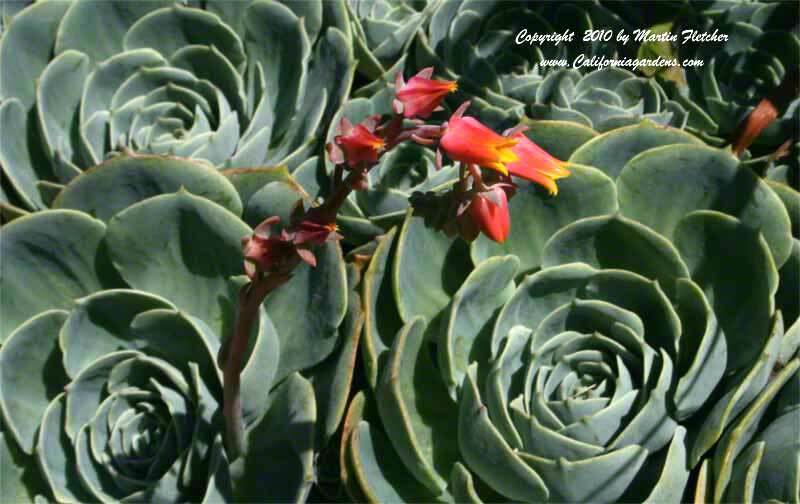 Flowers and foliage of Echeveria secunda - Hens and Chicks. High resolution photos are part of our garden image collection.